Justin has been a Brand Ambassador for Royal Talens North America since the beginning of 2014. Justin has worked with them in a variety of capacities, but most recently was sent to Louisville to spend time teaching at the University of Louisville and Bellarmine University. Justin has had an informal relationship with Royal and Langnickel since 2009 but in 2016 officially signed on as a Brand Ambassador of their paint brushes. 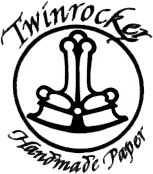 An Indiana gem, Twinrocker is one of the best handmade paper mills in the country. While Justin was at Purdue in 2002, he got a tour of the facility and has been using their papers since. In 2012, Justin started managing their social media and on several occasions has had the opportunity to get in the mill and make paper.